Design solutions specialist Häfele UK has launched a brand new Studio Partner scheme, offering exclusive products, extensive marketing, showroom display and customer lead generation to hand-picked independent kitchen studios across the UK. 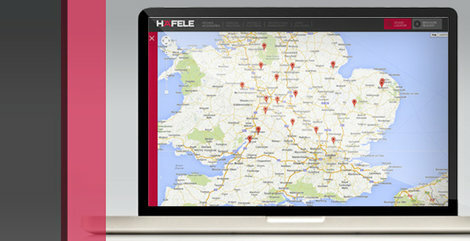 This clever initiative follows the recent launch of Häfele's consumer website, www.ideasforliving.co.uk, a platform which showcases Häfele's premium product range and directs consumers to Häfele-approved Studio Partners through an online studio locator. Having already engaged over 100 independent kitchen studios in the partnership project, Häfele is looking to expand the scheme by adding a wider range of showrooms to the exclusive network over the coming months and throughout 2014. Jodi Garrett, Business Development Manager at Häfele UK explains: "We are currently taking applications from studios across the UK to join this unique programme. Häfele doesn't sell direct to the consumer, instead we choose to partner with premium independent showrooms, which provide homeowners with expert advice and first class service. "The network of Häfele-approved studios will benefit from exclusive discounts on products from our premium range of design solutions as well as support with display products, point-of-sale, customer lead generation, social media and brand new stylish literature. "Our Häfele-approved studio network is also heavily promoted through our consumer website www.ideasforliving.co.uk, which we will be adding more product ranges to over the coming months and new consumer brochures. We are a premium brand that's constantly looking at ways of improving our customer experience so we're always keen to hear from potential studio partners that are interested in working together."